I give due credit to President Trump, whose pro-business rhetoric and policies are fueling a robust recovery from the Obama-induced economic doldrums. But I am compelled to note that there is a long row to hoe when it comes to removing decades’ worth of regulatory shackles from the economy. Since the first four months of 2000, when the labor-force participation rate peaked at 67.3 percent, it declined to 62.3 percent in 2015 before rebounding slightly to a range between 62.7 and 63 percent. It now stands at 62.7 percent. Further, workers who were pushed into part-time status during the Great Recession were not as fully employed as they were when they were full-time workers. 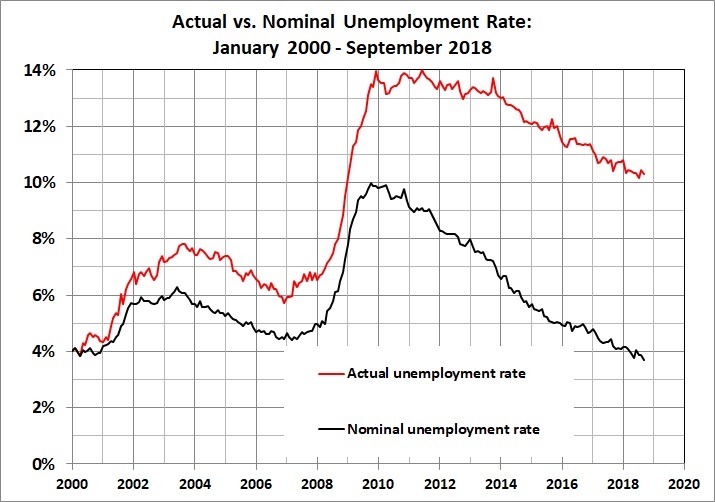 The nominal unemployment rate doesn’t reflect that shift, thus further understating the real unemployment rate. I constructed the actual unemployment rate by adjusting the nominal rate for (a) the change in the labor-force participation rate and (b) the change in the fraction of workers in full-time status. The sad fact is that the real unemployment rate didn’t peak at 10 percent in 2010, nor has it declined steadily since then. In fact, the rate peaked in the range of 13 to 14 percent, and remained in that range (with a few exceptions) from September 2009 to February 2014. The real rate is now 10.3 percent — not the 3.7 percent advertised by the Bureau of Labor Statistics. The last time the real rate was lower than 10.3 percent was in January 2009. See Part V of this post.